Chris began his career as a volunteer firefighter, where he assisted the ambulance crew. Chris quickly became engulfed in EMS, and proceeded to obtain his basic EMT certification. Chris excelled, and within a few short years, returned to school to earn his advanced EMT certification. 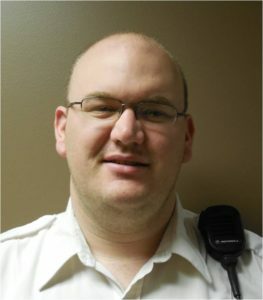 Chris then began working for one of the largest EMS providers in Northeast Indiana. Chris progressed quickly, and was selected as a member of the Disaster Relief team. Chris was deployed to Hurricane Katrina in 2005, where he assisted others in the face of total devastation. As a field training officer, Chris mentors and guides new employees on a daily basis, instilling in them the same values he exemplifies. Chris embodies the mission and values of Paramedics Plus, which include compassionate quality care and service. Chris has received numerous commendations from patients, family members, other organizations, and coworkers alike. Chris also volunteers his time with the Boy Scouts, church organizations, and explorer programs. Chris exemplifies the vision of this organization through his commitment to going above and beyond to provide the best care possible for patients and families. Chris maintains a positive attitude and outlook, and consistently seeks ways to improve the organization, others, and himself. Chris is a true asset in the field of EMS.